Last week's job report showed a stabilization in the unemployment rate at 9.7%. The rate is just 0.4% lower than the recession highs of 10.1%. 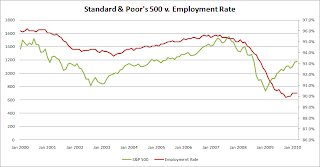 Yet, the stabilization of the unemployment has allowed for a dramatic rise in US equity prices. 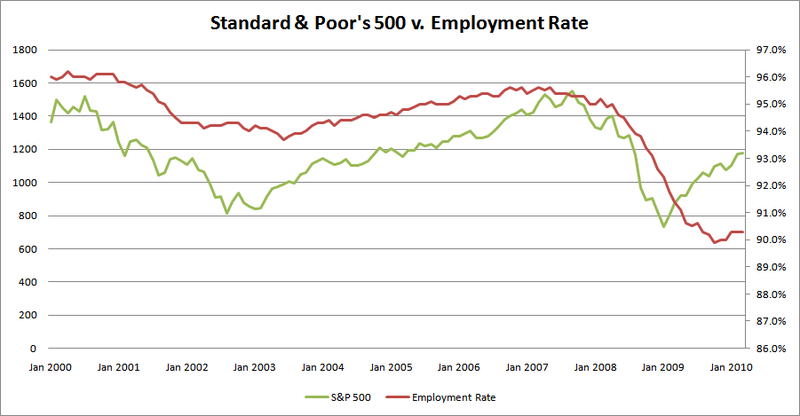 The graph below shows the employment rate (1 - unemployment rate) versus the Standard & Poor's 500. The chart below is a great lesson for understanding how much of a future discounting mechanism the stock market is. Stocks are up nearly 75% from the lows in a continuing rally that began as the unemployment was still rising. It is interesting to note how few bullish voices there were at the bottom yet the market was able to discount improving economic conditions. With the Dow back to 11,000 and back over pre-Lehman Brothers levels, I would expect to see real improvement in the economic backdrop for substantially more upside to be attained in equity markets. This part of the rally was seemingly fueled by a movement from "horrible" to "bad", an end to the deteriorating economic landscape. I would be surprised if we don't see further job gains in the coming months.